This amp seems to be designed to have a particular sound character. It is detailed and lively, particularly in the upper octaves, but lacks a little bass extension and isn't always the most melodious. 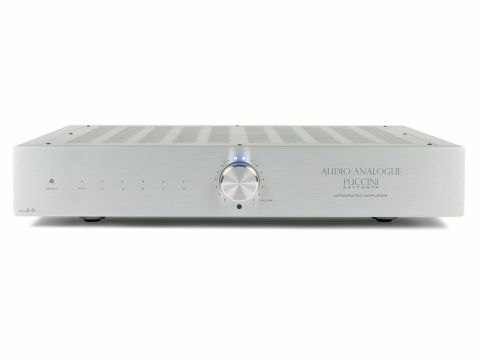 In its promotional literature, Audio Analogue likes to make much of its inspirations in Italian art, though it's not immediately obvious what this link might be, except to say that this is a nicely conceived and executed piece of industrial design, with well-finished aluminium front, top and sides. The basic specification is nothing unusual, with a 70-watt rating and five line inputs, plus a subwoofer (line-level) output. There's also a phono input capable of dealing with both moving magnet and moving coil cartridges. Selection between inputs is, as is usual these days, electronic and the volume control is also electronically switched. We have some slight reservations about the way this has been implemented, for two reasons. First, the rotary control is a 'jog' function – twist one way and volume starts ramping up, the other way and it heads down. The trouble with this is that it's largely a matter of luck whether one gets one step or two on a quick flick of the control. Second, the volume steps are rather bizarrely arranged. Although they are a mere 0.5dB at the very top of the range (although the volume will never normally be set that high! ), over most of the typical listening range they are 1.5dB, which is quite large, and given that double-stepping often occurs it is, in practice, quite hard to adjust volume in less than 3dB increments. Internal construction is very neat, with a mixture of through-hole and surface-mount components. The mains transformer is large and has separate windings for each channel, making the amp very nearly dual-mono, and component quality is good throughout. There's more than one approach to designing good-quality hi-fi. Unconditional neutrality is obviously one way, but a little character is not necessarily so bad and some listeners certainly prefer that if it's done right. It seems to us that Audio Analogue has unashamedly gone down the 'character' route with the Puccini Settanta. As a result, some of our listeners' notes seem a little contradictory at times, but a pattern does emerge. While one complains of a lack of bass extension and weight, another praises bass control; then, in a later track, opinions vary wildly over how dynamic the sound is. All this, however, comes down to how each individual reacts to the subtle departures from neutrality that make up the Puccini personality. For a start, bass control is not quite the same thing as extension and weight. A little abandon in the lowest octaves can come across as greater extension and 'control' is a bit of a loaded term – one listener's control is another's dryness. As for dynamics, it seems that in this case the sound has more of this in some frequency ranges than others. The upper midrange is particularly lively and, as a result, vocals seem dynamic, but lower frequencies are perhaps a little less so. In the treble there is also good dynamic swing, but what's most noticeable here is an unusual level of detail. One listener commented that this amp gave the best rendition of wire brushes on a drum-skin. On the other hand, the treble does sometimes seem a little dry. One of our favourite test tracks features quite a lot of subtle percussion, fading naturally into silence, and we felt here that the sound died a little quicker than we're used to. Overall, then, this amp seems likely to give most pleasure to those who value clear, precise sound above all. It will also please LP lovers, by the way – the phono stage is well above average with particularly good detail and clarity.